Hair Color by Sacramento’s Best Stylist. Are you using the same hair color? I get this question a lot. Are you still using your same color line? And yes, I’m still using Colorly. It has been my standard source for the finest quality, professional hair color for over 20 years. Our exclusive Italian color line consistently produces that fresh, vibrant, natural color look. Phyto-Wheat Proteins deliver superior conditioning results and ensure the structural integrity of your hair shaft. Colorly uses a better quality dye molecules for color stability. I look for depth, tone range, luminescence and longevity in a color line. I want your investment and my work to look as good as it can, as long as possible. At the end of the day, we know from experience, that better products produce better results. 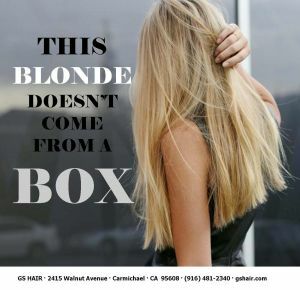 A perk of having owned one of Sacramento’s largest salons for nearly 9 years was that product companies were always bringing in boxes of thing for me to try. That included the most advanced and heavily marketed color lines available. I tested every color line against mine and have never been able to produce a better result. Thank Casey for being my test subject for over 20 years now. And yes, as an added service, I still add Moroccanoil® to every bowl of color, to protect the feel and condition of your hair. GS HAIR, 2398 Fair Oaks Blvd. Ste 9, Sacramento, CA 95825. Book direct through our same number (916)838-4642 iText. E-mail us at gshair@sbcglobal.net. Our new studio is located on Fair Oaks Blvd. and Fairgate Drive, still on the ‘miracle mile’ of hair salon row. See you at the studio!